Behind the Scenes: Laura Louie’s ScrapSimple Club! 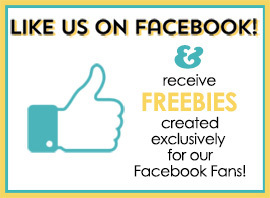 Home / All Posts / Behind the Scenes: Laura Louie’s ScrapSimple Club! Each month we get a glimpse behind the scenes of our Scrap Girls ScrapSimple Club designers, and this month’s designer is Laura Louie! Click here to check out Laura’s ScrapSimple Club at a great price! The first thing I did when I started working on the club was research, research, and more research! 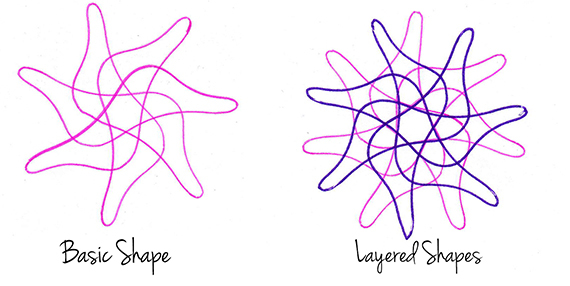 I wanted to find some great samples of spirographs that I would be able to recreate in Adobe Illustrator. I mostly looked at stock photography sites and spent a lot of time flipping through the manual that came with my Spirograph toy. It was during that research that I stumbled up on guilloche and realized that they would marry up with the spirographs beautifully! 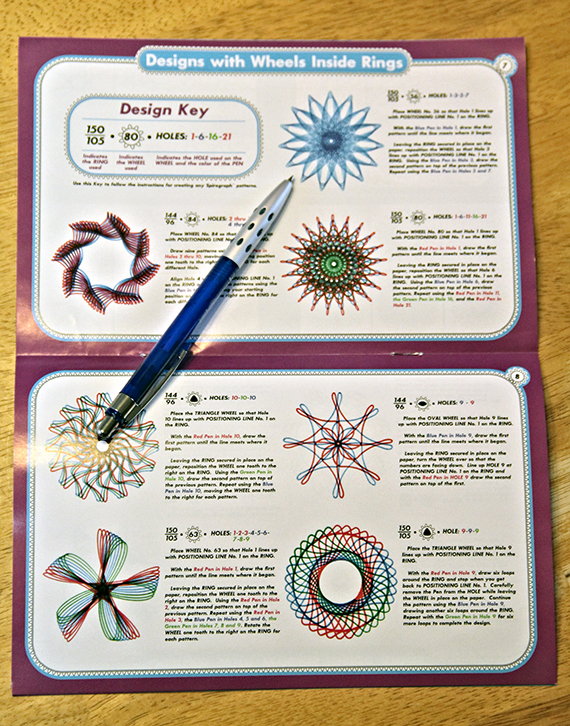 The inspiration for this club came from a Spirograph set I found while food shopping in BJ’s! I found it in the toy aisle and then stood there thinking about how much I had loved spirograph as a child. I also needed to come up with an excuse to buy it! Then I remembered the monthly club and had the prefect excuse! Then I spent lots of time playing… I mean “developing samples” that I could try recreating in Adobe Illustrator. 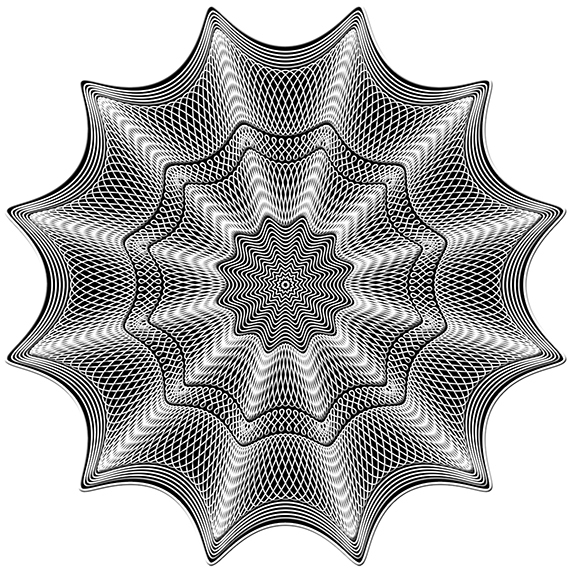 I would try to break each spirograph or guilloche down to it’s most basic shape. Then I would create that basic shape and rotate it until I was able to recreate the design in Illustrator. 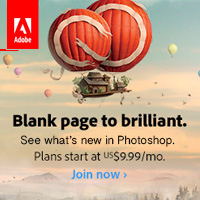 I work on all the products at the same time. 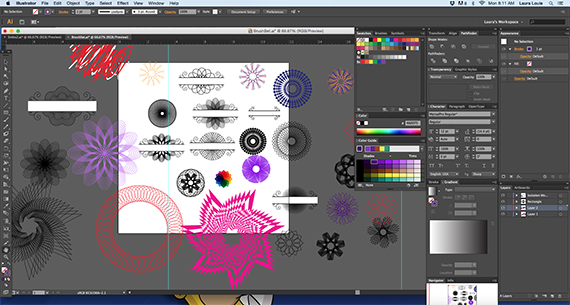 In this club, I might create a spirograph shape intending to use it in a paper pattern, but then decide it would work better as a brush. In fact, if you like at the screenshot below, you can see that my workspace is all over the place! In the end, I decided just create numerous guillotines and spirographs, and then modified them to work for each specific product. My favorite thing to design is probably always going to be brushes! I’m not sure why exactly – it could be because they are so versatile or maybe it’s because they can be customized in so many ways. I had a great time creating the BrushSet: Spin Your Wheels. I tried to pick the shapes I thought were prettiest because I wanted them to stand out in each layout. I liked applying gradients to them the best because it really ties in that beautiful blending of colors that spirographs create! 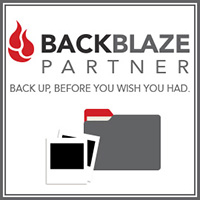 I liked that they could contain a few simple lines of journaling details (like a date, or a location) or they could showcase a beautiful page title. I would also image that they could create a background for a cluster to rest on, or even let half of a brush pop out from behind a photo. I think if I had to pick just one word to describe my club, I would choose “spinning”! I love how the lines spin with one another to form beautiful patterns! I tried to give the club a feeling of momentum with the shapes and lines constantly interacting and weaving within one another. Even the guilloches have a feeling a movement as the shapes expand and lines vibrate as they interact. You can color them anyway you like – from subtle and totally tame to completely bold and wild! I personally found that I liked alternating only two or three colors to each guilloche rosette because it gave them a more simplified feel. I especially loved them with soft shades of pink and periwinkle but I was also picturing them with Halloween colors applied! In particular, Guilloche Rosette 2 reminded me of a spider spinning its web! I spent about two months working on this club. I was given some great advice about balancing simplicity with the detail-heavy designs of spirograph and guilloche. So I took a step back from focusing on all that line art to contemplate how best to balance the club products. Eventually, that is where the ScrapSimple Paper Templates: Subtle Schmutz came from! 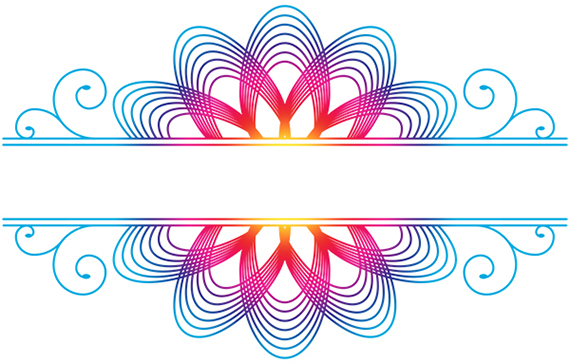 The name of my club is a little homage to the Spirograph toy of my childhood! Specifically, to the little plastic wheels that you would use to draw those beautiful patterns! 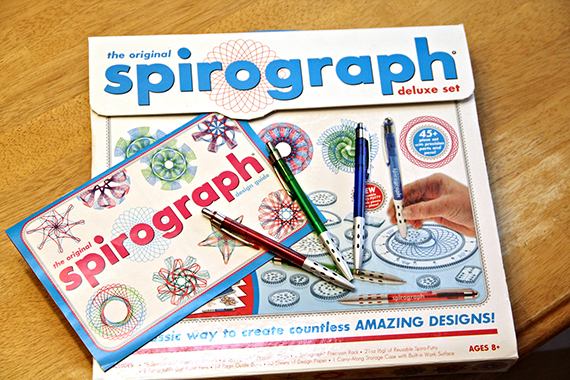 I’m glad I used the monthly club as my excuse to buy that Spirograph kit I found in BJ’s! It is just as much fun (if not more so) as an adult to play with!